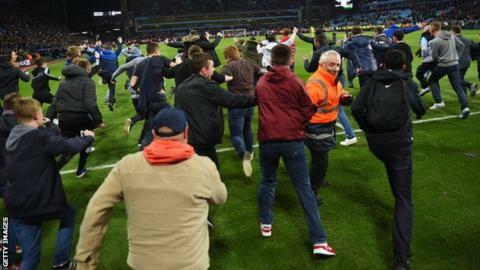 The Football Association described the scenes at Villa Park as "disturbing"
Aston Villa have been fined £200,000 by the Football Association following pitch invasions at the FA Cup quarter-final against West Bromwich Albion. Some home fans ran on to the Villa Park pitch in injury time and at full-time, while seats were thrown from the away fans' stand at the match on 7 March. Villa, who won the tie 2-0, will face Arsenal in the final on 30 May. The FA said the West Midlands club had also been "severely warned" as to their future conduct. Villa apologised after the match, saying their victory had been "marred by the actions of those who could not control themselves". West Brom boss Tony Pulis criticised the stewarding at Villa Park and said his players' safety was in jeopardy.